Find enjoyment and satisfaction by taking a piece of cord or leather and fashioning a beautiful new jewelry piece with it. Welcome to Volume 4! From a casual leather bracelet to an edgy arm cuff, the patterns in Volume 4 are diverse. 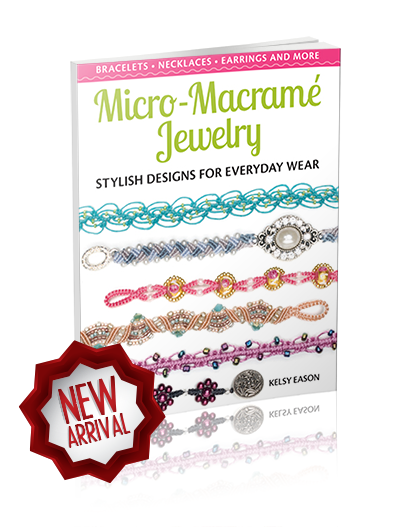 Micro-Macramé Jewelry by author and designer Kelsy Eason, contains 20+ knotting projects for the beginner. Her teaching style is simple for the beginner to learn and she adds tips throughout the book to make the experience even more enjoyable. 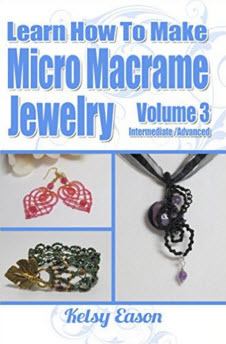 If you are looking for a more detailed tutorial to learn how to make Micro Macrame Jewelry, I have three books available now on the Amazon Kindle Store. 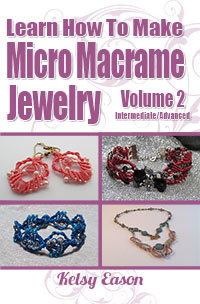 This illustrated guide teaches you step by step how to start making Micro Macramé Jewelry from beginning to end. This book has been written for the person with little-to-no knotting experience. Beginning with the basics, you will learn how to create the necessary padded work surface, you’ll learn each of the basic knots and then move on to 5 fun projects. 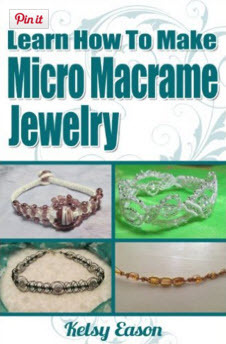 Learn How To Make Micro Macramé Jewelry, opens with a straightforward bracelet allowing you to familiarize yourself with the feel of the cord, giving you time to practice tension as you tie the most commonly used knot in micro-macramé. As you progress you will be introduced to a new knot or two, which then culminates in a final project which uses several knots. In this follow up guide, I wanted to move forward into some more advanced techniques and knots. I’ve added some new knots and have increased the complexity of the designs which really brings you into what I enjoy the most about the craft. That being the intricate details and delicate beading which sets apart this style from other forms of jewelry making. My approach is even different from many other knotting trends as I lean towards the Margarete Lace (or Margaretenspitze) technique. The book includes 7 fun projects, 4 of which can only be found in this book. I am excited to introduce to you a bracelet design made softer by adding ribbon to it. Pearls also help elevate the “Relevé” composition to a higher level. This romantic feel is carried on with a long necklace that is subtly steampunk, incorporating beads and key charms. “All Keyed Up” was created for my college age daughters, who are thoroughly enjoying wearing this style. Changing things up is the “MoonDance Pendant”. It is a unique design inspired by wire wrapped jewelry. Now you can have that look without learning wire wrapping techniques. For a more casual offering, I have created a ”Wrap Bracelet” pattern which looks like four bracelets but is really one. I love the versatility of this one and have made several to wear out and about. 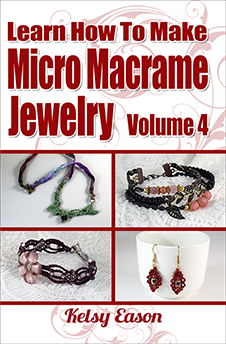 Another enchanting bracelet pattern and two dazzling new earring patterns round out this book. An abundance of pictures and clear instructions are given to speed you on your way to successful jewelry creation! This book includes 7 projects that are exclusive to this book.